There is an island in the Pacific Ocean that is home to a number of unusual statues left behind by its ancient inhabitants; The countless strange figures, carved in the distant past depict what many consider an otherworldly influence. Some of these statues depict what many refer to Reptilian Beings. 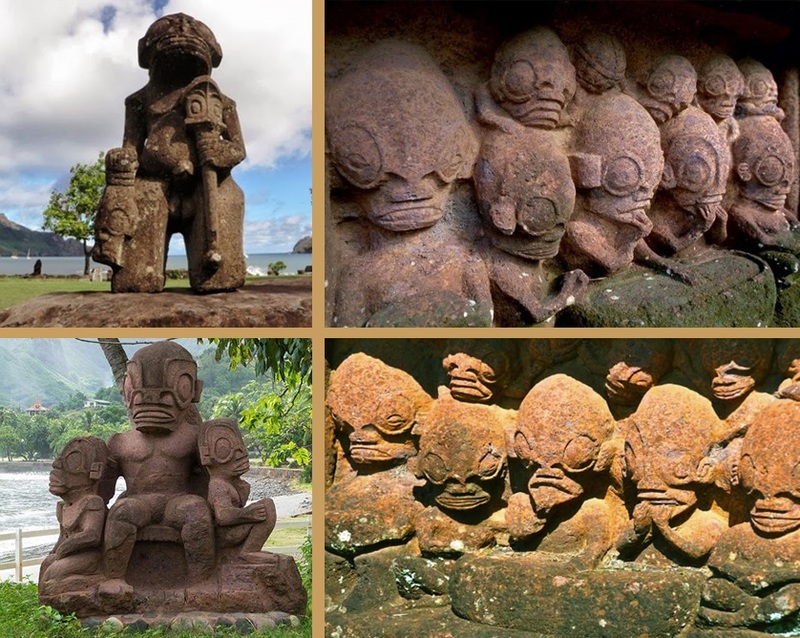 Could these mysterious, yet beautiful statues be nothing more than mythological beings worshipped by the ancient inhabitants of Nucu Hiva, the largest of the largest of the Marquesas Islands in French Polynesia? Or, is there a possibility that they depict representations of ancient alien beings? Mysterious yet beautiful places plague our planet. Through our civilizations ancient history, countless cultures erected some of the most amazing places on the surface of the planet. And while most of us fall hypnotized by ancient sites such as the Pyramids of Giza, The Great Sphinx, Teotihuacan, and Macchu Picchu, there are many other sites equally magnificent and puzzling. One such site is located in Nucu Hiva, the largest of the largest of the Marquesas Islands in French Polynesia. There we find the ancient archaeological site of Temeea Tohua, home of a series of strange statues which many authors believe may depict otherworldly beings. While other disagree and suggest the enigmatically caved statues are the result of the imagination of Polynesian settlers, others point towards a possible ancient alien encounter, which took place before written history. As noted by recent studies, the first settlers arrived at the largest of the Marquesas in French Polynesia some 2,000 years ago, most likely from Samoa. There, the ancient settlers of the island built a number of strange statues that depict beings that look completely different from humans. It’s almost as if the ancient settlers of Nucu Hiva worshipped some Reptilian deity. The statues look like something from an alien movie. The question is, what did the ancient artists try and depict? Are these mysterious beings illustrations of their Gods? Or, as some ancient astronaut theorists suggest, are these mysterious statues evidence of an ancient alien encounter, thousands of years ago? The statues look terrifyingly impressive. From afar they appear as beautiful carvings left behind by the ancients, but upon closer inspection, you notice fascinating details. The statues feature big eyes, large elongated heads, small bodies, with a mixture of statues with huge bodies, and other several strange looking features that make you wonder what could have inspired the ancient inhabitants to carve such non-human features? Is it possible that the ancient settlers of Nucu Hiva depicted Reptilian Gods? In modern times, numerous conspiracy theories have risen from the stories of Reptilians or Lizard People. Various ancient cultures like the Ancient Sumerians, for example, depicted strange beings with reptilian features. These mysterious beings are believed to have been the Gods, who one day, came down from heaven and settled on Earth. For example, if we take a look at the Ubaid Period, we will find that more than 7,000 years ago, the inhabitants of Ancient Mesopotamia worshiped the so-called lizard people. Curiously, evidence of this cult has been found at the Archaeological site of Al-Ubaid, where experts uncovered numerous pre-Sumerian artifacts dating back at least 7,000 years. Among these items, strange looking figurines have been discovered with a mixture of humanoid and lizard-like shapes. At Nucu Hiva, far from Mesopotamia, we find similar Reptilian-like statues. There are certain figures at the French Polynesian Island that even depict what appear to be strange Grey-Like aliens. The ancient artists of the island left a message in stone. They carved strange figures with small bodies and huge elongated heads that have strange, over-sized eyes. When looking at this from a certain archaeological view, it would be logical to assume that whoever carved those statues would have followed certain patterns when carving the statues, so how could it be possible that at the same location we find two types of statues that are not very similar. In addition to the statues with huge bodies, over-sized heads, and mouths we find other figures with different aspects such as small bodies with over-sized eyes, relatively normal mouths but with an entirely different aspect when it comes to the nose. While on the bigger statues the nose seems elongated and straight, the smaller statues feature noses that resemble a human nose. This mixture of different styles of art raises numerous questions. What are these statues? Are these depictions of alien races that have visited this island at some point in the past, as some researchers suggest? Or, are these statues the result of a mixture of cultural influence?